Review Roundup: Mazda5 - Cars! Cars! Cars! Walking around our NYC neighborhood we noticed that someone... hell, everyone, has taken the "mini" out of minivans. In fact, comparing the original Dodge Caravan of 1984, today's minivan has grown significantly from its humble beginnings to quite a big vehicle capable of towing and hauling up to eight people in quite a bit of comfort. From being able to carry seven in semi comfort, today's minivan will carry up to eight in significantly nicer quarters. From multi-zone climate system, to multiple sunroofs to multi-screen entertainment systems, today's minivan has it all. But you pay for it, even if you don't need as much space. Face it, unless you just keep making babies, it's hard to justify the size of today's minivan even though a sedan might be a bit small for a family of four. But the minivan has grown more than just size -- a loaded minivan by today's leaders (Honda, Toyota) runs near $40k. Compare that to just $15,500 for Dodge Grand Caravan LE from 1988*. Now, granted, the minivan of today comes with a lot more features and power, but comparing top-of-the-line to top-of-the-line is fair and it's an example of what was the best at the time. Anyway, $15,500 in 1988 is about $25,150** in today's dollars so can you get anything for $25k? Sure, but it's far from top of the line. So, where are we going with this? Is there a minivan that's still mini and has a topped out price around $25k? Yes. The Mazda5. This vehicle, while familiar to Europeans, is new to U.S. shores. We've read Mazda is hoping to sell 15,000*** a year here and so far Mazda's sold 14,465 though Oct 2006. And sales gains are in a good place for the Mazda5--up over 370% from Oct 05. What is it about this model that's ringing true with consumers? Our main attraction to it is its size (which, duh, maybe that's everyone's attraction) because we're in the city and parking is scarcer than a good public school. We haven't tested one yet, so we gathered up some recent reviews to see what the consensus is. Are the experts are Diggin' It, Lukewarm or Be Hatin'. Slowing down the quick procession of semi-sportscars. We've saved powertrain for last because it may be the only weak link in what is otherwise a very attractive, versatile and enjoyable vehicle. Calibrated to trade three of the Mazda3's 160 horses for a flatter torque curve, the same 2.3-liter 16-valve DOHC four that seems so lively in the 2800-pound Mazda3 seems a bit overwhelmed by the Mazda5's 500-plus additional pounds. We sampled it with both five-speed manual and optional four-speed automatic transaxles with two normal-sized adults and no cargo on board and found it, well, slow. Informal 0-60 runs with the automatic were 11 seconds plus. This seemed to be a fair, yet un-passionate review. And we'll cut some slack because it is a minivan and how passionate can you really get about one? The Mazda5 is like a mini minivan or a short puffy wagon, no mater what its nomenclature it was a great car for me. Over the years of test driving new cars in the New York area I have never received an admiring second look, but this time I received many compliments and questions about the car I was driving … the phantom blue 2007 Mazda5 Touring. The Mazda5 handled nimbley yet felt big and solid and more than safe enough to traverse the L.I.E., the Garden State, and did really well on the East and West Side…and all around the town, it's big enough to carry 6 passengers yet small enough to easily parallel park. Talk about gushing! Reporter Bob Gordon didn't once mention the issue of engine power (or lack thereof). This dude started out happy and ended happier. The ride, which feels so taut and sporty, can seem a little bit harsh, especially when the car's loaded down with people and gear. There's a fair amount of wind and road noise that work their way into the cabin. It's sensitive to crosswinds, and is light enough that it gets blown around a fair bit. This was a very fair review and, despite a bit of a hoon (we're guessing), Mr. Yap was certainly diggin' this vehicle. Driving dynamics and ride compliance of this unconventional troop carrier still have Mazda written all over them. The underlying chassis bits, ABS, and electrohydraulic power steering system are recalibrated for a demanding duty cycle and feel equally capable of challenging rush-hour traffic or a twisty two-lane. We think Mazda's good reputation helped the Mazda5 start off this review on a positive note even before the testers got behind the wheel. The 2006 Mazda5 is more utilitarian than fun. That said, it's a pleasant car that in some ways delivers more than expected, although coming up a bit short in a few. From behind the wheel, the Mazda5 is an OK driver. Steering isn't especially precise, but it has good on-center feel and directional stability. For such a relatively tall car, there's little buffeting from crosswinds or passing trucks. Brakes are solid, with communicative pedal feedback. Throttle tip in can be a bit quicker than expected, especially when accelerating from a stop around a corner. But for the most part, engine response is easily managed. OK, another fair review. We don't get the impression the reporter would buy one, however. This is the kind of vehicle that will find its way into American hearts as quickly as a sad-eyed puppy. The Mazda5 proves that a practical vehicle does not have to be a dull vehicle. This little wagon is fun to look at, fun to drive, and fun to show off to your friends. It will appeal to a growing family as easily as it might appeal to a young college-bound coed with lots of friends or even her empty-nester parents. And making papa proud of his sensible daughter is a win-win bonus. The reviewer gushed and gushed about the Mazda5. Which makes us wonder if we'll see more manufacturers making these kinds of vehicles. Oh, one other thing about those bigger vehicles (SUVs and big minivans): They're no fun to drive (unless you think driving around in your living room is fun). Even if you forget the Mazda5's affordability and adaptability, it's still a hoot to drive -- and it's a brilliant car. Man, did Colin like this ride. Colin's a small-car kinda guy, so this was going to appeal to him even before he turned the key. But he's still pretty critical, so we included the review. I'm not a minivan guy, but I could easily see living with the Mazda5's convenience, flexibility and practicality. The Mazda5 might just be the minivan for people who hate minivans. Wow, this is a loved vehicle. We're pretty warm towards Mazda since the Mazda3 hatch is pretty friggin' slick, the Mazda6 comes as a sedan, hatch, and wagon (that's pretty cool to us), the and MX-5 now has a hardtop. And all the while keeping style a high priority. We thought the whole zoom-zoom campaign was a bit disingenuous until the Mazdaspeed models came out -- then we shut up. So, what's our take on this model? 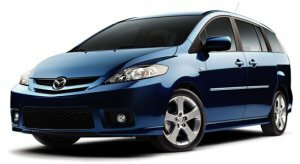 We think, assuming Mazda doesn't have horrible quality control issue, that the Mazda5 will exceed sales every year it is available. As we went to post this, we found out that the '07 model now has leather seating as an option and also has a DVD entertainment system. So a really loaded Mazda5 now tips the scales at $25k. Still, very reasonable for what you get. We'd really like to see a bit more power and a 6-speed automatic transmission standard with the thing -- regardless of trim level. Come on, Mazda. How about a bit more zoom? *That's the most reliable data we could find. ***Yeah, this seems pretty low to us, too. But if we were missing a zero in that estimate of 15,000 we'd have to conclude the thing was a total failure and since we haven't read that we're guessing Mazda did a good job with the estimation of sales. Sorry the pictures are so typical. Mazda's press site blows. It's really bad. In fact, the dudes who made the Mazda5 should get reassigned to the press site so we can get some real pics. The pics here are from the consumer site which is far, far superior. I'd have to agree - we bought one to get the heck out of Minivan territory. We've got 4 kids 6 & under, and except for cargo room (which even vans have an issue with), we like it.